Hello everyone, welcome. Last night I attended our regular games session with friends where we were able to play the game Dreamwars. I have written about this game before, doing an unboxing and how to play video way back in February. If you want to read that post and see the video then click on the previous link. This post will be about experience of play. Dreamwars is a game of Steampunk and horror, where Humans, Wildkin, Devar (not Dwarves) and Evarin (not Elves..) live in various lands, with access to musical magic and steam driven automata. We set up the board for the first scenario, where one of the Nemesis Warlords was trying to summon the Knight of Shadows to do his bidding. We, the players were tasked with getting Dreamshards to the Synod of Voices to stymie the nemesis. I was a bit distracted during set up as the owner’s cat, Smudge, had decided to come in and say hello. Smudge was wearing one of those collars that made him look like a walking, fuzzy lampshade which did not stop him from coming over to say hello and mooch for attention at every opportunity. His efforts were occasionally thwarted when the collar bumped the chair. Undaunted, he still wanted to headbutt my hand as far round behind my back as he could in the name of getting attention and purring. It was marginally less inconvenient than the time we played Microscope, and their other cat, Smog, decided my shoulders were a good place to sleep. I’m actually more a dog person but some cats are cool. I had the following Not Elf character. I started play with a Longbow, a Shield, two suits of armour, two Dreamshards that could heal and two spells. One was a fireball and the other augmented my martial prowess. For all intents and purposes I was a Not Elven Fighter Mage. We also had a Human Pirate, A Lion Bounty Hunter, A Not Dwarf Gunner and a Human Ranger. With the game set up and a quick overview of rules given by me, we got started. I am the one with the bendy spear on the left, with a mass of Nemesis tokens quite close by. The scenario was to run that particular blockade dropping off many Dreamshards before the Shadow Knight was completed. I took Player 1 to demonstrate a turn. I moved forward, but was too far away to attack. I ended my turn on a location and had an Outland Mystery Adventure. What that means is there are certain locations in the wilderness, marked with a compass, where if you end your turn there you draw an Outland Mystery encounter card. This serves as a mini side quest where things can go wrong or things can help. Everyone took their turns, but something niggled at me. And that isn’t just a euphemism for an affectionate moggy purring at my feet. The things that we had to get past to drop off our Dreamshards had ludicrously high life points. One had 30. A rule tugged in the back of my brain about some creatures not being included in every scenario, but we couldn’t find the rule and carried on. A few combats later, against the swarming mook level monsters and I was more convinced than ever we had something wrong. I stopped attending the constant feline needs and had a poke through the rulebook. The game was in recess as there were urgent real life issues to attend to. That was when I found the rule. Unless specified, Leaders and the largest creature types are not included in a monster horde unless specifically instructed. I looked at our gauntlet and picked out 2 leaders. That would explain why we couldn’t get past the blockade! That was also when we discovered there were some single game Ordeals. We made an executive decision at the table to start again, with the properly balanced (and totally not unbeatable) monster horde, and a standalone adventure. We fed the lampshade, chose a new villain and reset the board. This is the villain three turns in. At the beginning of each turn, event cards are drawn dictating monster spawns, other events and astrological symbols. After three turns it is possible to trigger a boss ability if the symbols match something on the boss card, as above. We all thought this was a fantastic mechanic. The new scenario was that we all started in one town, whilst another is under attack by a massive sea serpent. We could fight it from turn one but it has a number of special abilities that make it tougher to beat, unless players gather items from various locations around the board. 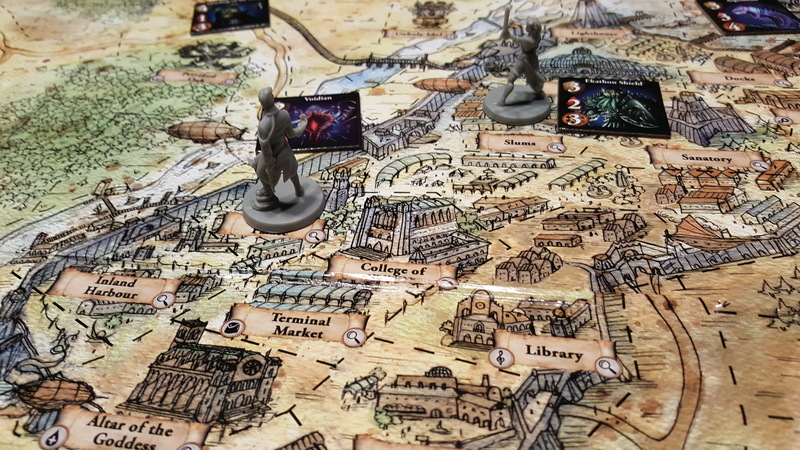 Naturally three of five players rushed out to begin gathering items, whilst two players remained in the starting town to trigger City Intrigue Adventure cards. These are city based side quests, similar to the Outland Mysteries which can be beneficial or not. We all thought this was a fun idea as we were curious about what happens in the city intrigues. Unfortunately this caused them to get trapped in the city which more or less swarmed with monsters by turn 2. Meanwhile the rest of us were fighting our way through other enemy formations trying to get the artifacts to fight the serpent. Simon, one of the other players, and myself managed to get one of them each after a couple of failed attempts and Simon ventured on to the next artifact. Unfortunately, our two trapped players were in a bit of a situation. If they healed themselves they would become primary targets of the swarm of creatures, so a decoy was needed. As the closest player with no wounds, I was offered as the sacrificial Lion. (I wasn’t playing a Lion/Wildkin, I was Evarin/Not Elf but there was no way I was going without a fight). Three nasty beasties were attacking my friends in the city, but as they were “At Death’s Door” they couldn’t be targeted so I moved into range to lure them out of the city. I was able to snipe a little at the monsters before they caught up to me, but I took an inevitable pounding at their talons. Fortunately, I had some Dreamshards that caused healing, and a decent suit of armour and shield which meant the beasties didn’t have it all their way. It was also kinda fortunate they did all swarm at that point as it allowed me to cast my firestar cantici (Think explosive fireball spell) which destroyed one, and severely wounded the other – and me. But it was enough for me to be able to best the other in melee. The third beastie was dealt with by the walking wounded in the city and they wisely made a break for the countryside. Unfortunately time was marching on and our group was scattered over the map, with minions swarming every turn. And it was getting late. In the end up we didn’t get a chance to complete the game. We still had 10 turns to beat the sea serpent, but it is even money whether we would succeed. The gameplay itself was a lot of fun, and even the combat was fairly streamlined. We all enjoyed it. However we all found two fairly noticeable flaws in the game. The areas on the map are separated by dotted lines and of irregular size. This made it hard to see where one area ended and another began. It also made moving multiple creatures into a single area awkward as the creatures used regular sized square tiles, which don’t necessarily fit in all the regions. Miniatures would have been better and I am not sure how that was missed in development. Second, was the poor standard of English in most of the cards we read and in a lot of the manual. I try not to focus on language, grammar and punctuation when I am reviewing things as I accept perfect written English is an antiquated notion (and picking on it is a bit snobby), and when reading casual stuff things may be written by someone with difficulties in this area. With that caveat out of the way, the production team of Dreamwars failed in this particular area of presentation. The game was enjoyable, I give it credit where it was due but the written English on the Outland Mysteries, City Intrigues and Ordeal Descriptions was awful. It wasn’t the odd couple of mistakes that are inevitable in any large production, it was several mistakes on every card. We could still understand the intent, but after speaking to the multilingual person at the table we came to the conclusion that the cards were written in their native tongue and run through google translate. That gives sentence structure that is eye bleeding odd. This is a shame as the game is otherwise great. I won’t focus on this in future plays, I’ll just enjoy the gameplay and the intent and hope that if the developers make another game, they put in as much attention to this particular detail as the cat was in trying to headbutt my arm off.